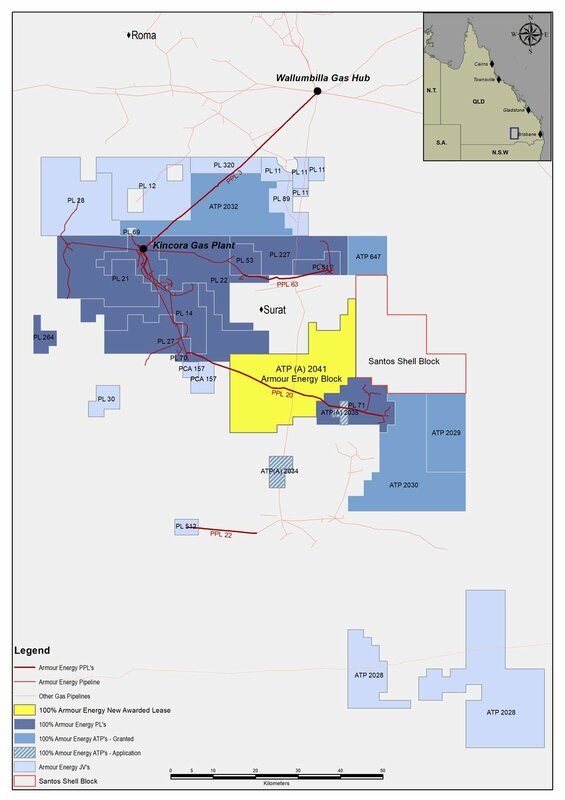 Over 3000km² of highly prospective western flank of the Taroom Trough of the Surat Basin, 15 Production Licences, 4 Authorities to Prospect and 4 Petroleum Pipeline Licences. A gas storage facility with a capacity of 7.5PJ, which contained 2.3PJ of sales gas at the time of purchase. Myall Creek 4A Development Well (PL 511). 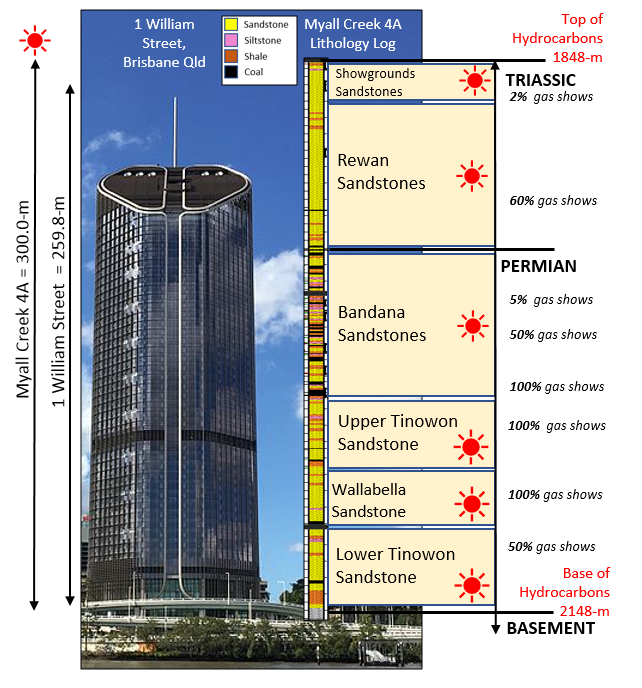 Tallest Building in Queensland - 1 William Street, at 259.8m from antenna spire to ground level. The Myall Creek 4A well production zone that will be targeted for completion, is 300m thick with multiple high gas chromatograph shows. Armour's Kincora assets, located near the Wallumbilla gas hub on the east coast of Australia, offer significant cashflow opportunities through the production of oil, gas, LPG and condensate. The acquisition sets Armour up to become a significant producer of oil, gas, LPG and condensate. Furthermore the Newstead storage facility with a capacity of 7.5 PJs (including 2.3 PJs of contained sales gas) provides Armour with a significant business opportunity to manage this facility and to maximise returns during periods of high gas demand. The Connection Agreement with APA Group allows Armour to supply gas to Australia Pacific LNG under the Company's Gas Sales Agreement with them. The Connection Agreement is an essential component in Armour being able to access the broader east coast gas market, including a wide range of industrial customers, wholesale customers and traders. In October 2017 Armour successfully expanded its acreage through the acquisition of a new exploration lease via the DNRM tender process. The new lease, ATP 2030, comprises 365 square kilometres and is contiguous with Armour's PL 71 and the Ungabilla block on ATP 754. Being immediately adjacent to Armour's PL 71 and its associated infrastructure, resources identified in ATP 2030 can be readily connected to Armour's Kincora Gas Plant and thus to market. "Armour draws together unparalleled experience in petroleum exploration, development and production in the junior petroleum industry, and the application of this to the Kincora Gas Project will see Armour emerge with a strengthening foundation on growing oil and gas resources and production." The plant became fully operational in December 2017 and raw gas from existing wells is now being processed and sold. With the LPG system operational, Armour will now gain operational experience and knowledge of the overall Kincora infrastructure (KGP, Newstead storage facility and gas gathering systems) and, over coming weeks and months, this will enable opportunities for performance and production rate improvements to be identified and implemented. During this period, gas production is expected to increase from 5TJ/ day to 9TJ/ day as production from existing wells is brought on line and utilisation of the Newstead storage facility is optimised. For the immediate future Armour intends to run the KGP at a steady state best suited to the existing infrastructure. Armour commenced oil production at the Emu Apple oil field (Emu Apple-1) in mid-August 2016 and has been producing since then at a steady rate of approximately 40 barrels of oil per day. Emu Apple-1 well is estimated to contain approximately 100,000 bbl of remaining recoverable oil in a 4 way dip closed structure in the Jurassic aged Boxvale Sandstone at a depth of 1400 metres.